Yeah I never tried working the numbers out like that @Colanoscopy. It seems a really high amount. I think I'll at least half the dose I'm giving them as that amount of magnesium even though it's a really important element for plants can't be good for them. All my plants have been getting that amount for the last 3 weeks or so and I've seen no ill effects bro. If anything the growth rate has increased. You have me worried now lol. so it's worth every penny of the price. I'll see how yours finish before taking the plunge. How's everyone been feeding the Agent K? Is she a heavy eater, or go lighter on the nutes? I'm in coco and using megacrop. I've been giving her 800ppm of megacrop, 5ml spoon per UK gallon of Epsom (a little bit to much by the look of it) and 1ml per litre P.K. The lower leafs are yellowing a little so I could likely push the mega crop ppm a little more but I make up one single feed for multiple strains and 800 ppm is where they can all thrive without mixing several different mixes. I hear you on mixing nutes for multiple strains. I have the amnesia× og kush, which is about a month old and she just started taking half strength megacrop, while the agent k is showing deficiencies at the same strength feed, and they're barely two weeks from sprout! I'd not worry to much as long as the deficiency is on the older growth. It seems the agent k is a bit of a nitrogen hoe. Mine is around 5 weeks under 12/12 and about 3 into full bloom. 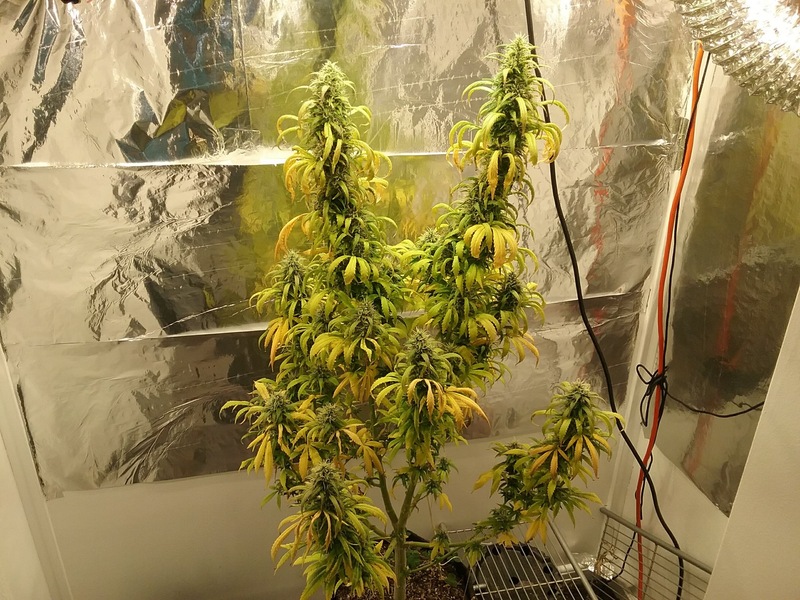 As you know we try to cut the amounts of nitrogen down in the bloom period so yellowing is kind of expected to happen for me at this point in the grow as she's pushing her energy and elements into bud growth. I may at some point weigh the megacrop on some scales for precision and it should allow me to mix up one big batch then add a little extra per litre jug so each plant get what it actually requires. It's all just a little time consuming at the minute for me to cater for each plant @SeymourGreen. If the agents are anything like their mother they can take heavy ppm levels, just start low and gradually bump it up. Near the end of one of my grows with megacrop v1 I was pushing nearly 2 ec with only minor tip burn. I've been weighing out the megacrop, but it's a pita because I end up getting more of the white chunks and less of the powder, so I've been weighing out the powder and then I'll throw a 2 or 3 of those white pebbles in and hope it balances out lol! I figured they were going to be strong feeders when they started showing slight cal deficiencies with the half strength megacrop feed. It's good to hear it from the man himself as I have you to thank for the little gems! No, I'm using the little scoop it came with, and then I just try to shake most of the white chunks out. What’s the chances of some pictures I’m sitting on pack of them courious how there doing! Haha! I didn't even think of it. I just figured if there were more white chunks in the scoop that week, so be it. lol It was an extra chunky kinda day! Like peanut butter... sometimes you feel like a nut... wait.